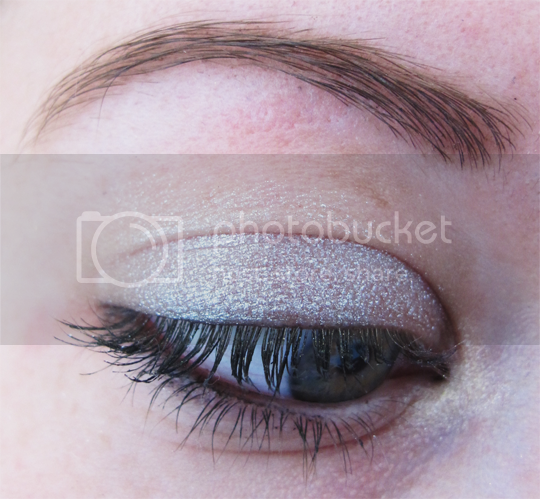 A metallic twist on smoky eyes is a big trend for this season. 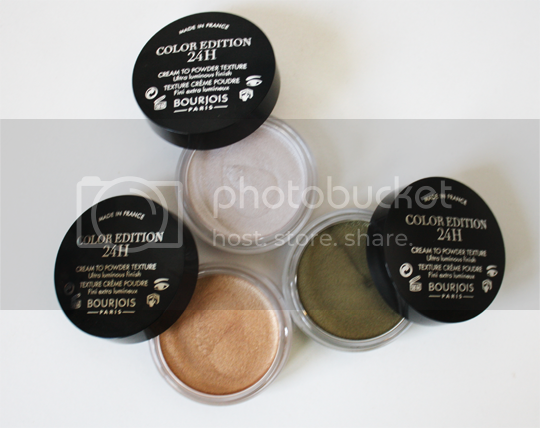 Bourjois have – of course! – hit the nail on the head with their latest release, a cream-to-powder formula following on from their ridiculously good cream blushes earlier this year. 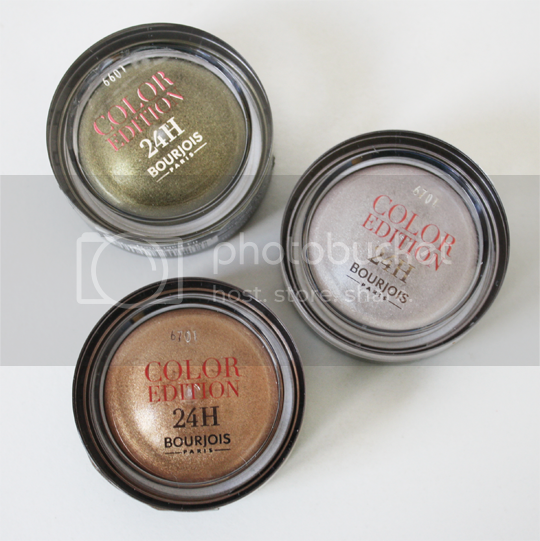 Allow me to introduce you to the Bourjois 24 Hour Cream Shadows*. These newest additions to the classic Little Round Pot line are pretty great. As mentioned above, they carry a similar cream-to-powder finish as their cream blush predecessors but the texture is fairly different. They actually feel bouncy and kinda dry to the touch, which is really quite novel. 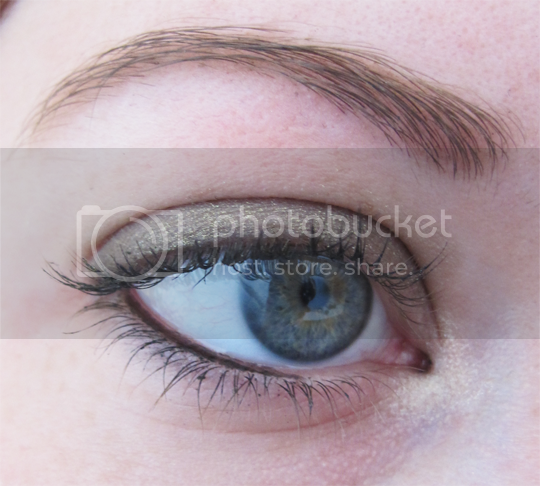 They feel super soft and glide onto the lids evenly with no difficulties. The finish, as promised, is just the right level of metallic thanks to 20-30% metallic pigments (the exact amount varies between shades) – they’re not too frosty looking but shimmery enough to be interesting. There are six shades across the 24 Hour range; the ones I have are Merveille d’Argent, a surprisingly wearable bright silver; Kaki Cheri, a beautiful khaki shade with a hint of a gold highlight; and Or Desir, a festive golden bronze. There is also a chic lilac-grey shade (Petale de Glace), a deep aubergine (Prune Nocturne) and an almost navy blue (Bleu Tenebreux), so you’re basically guaranteed to find a shade you’ll love. My personal favourite is Kaki Cheri, I’m really quite into khaki green shades for the eyes at the moment as I feel they complement my red hair really well. Through bearing the 24 Hour title, these are bound to be compared to the Maybelline 24 Hour Colour Tattoos, so allow me to weigh in with my two cents. The title is pretty much where the similarity ends between these two, they’re really very different. The Maybelline ones are creamy and very richly pigmented, and I find they work better as eyeshadow bases as opposed to on their own. The Bourjois ones are drier in texture and less highly pigmented, but they can certainly be built up and their cream-to-powder texture lends itself well to being worn alone so I would be inclined to say Bourjois would be the place to go if you want something really quick, no fuss, but still bang on trend. In terms of wear, I find that neither of them drastically crease on me (and I have very oily lids), but the Maybelline ones do last slightly longer before beginning to fade. Neither genuinely last 24 hours, but why would you need any makeup to actually do that? 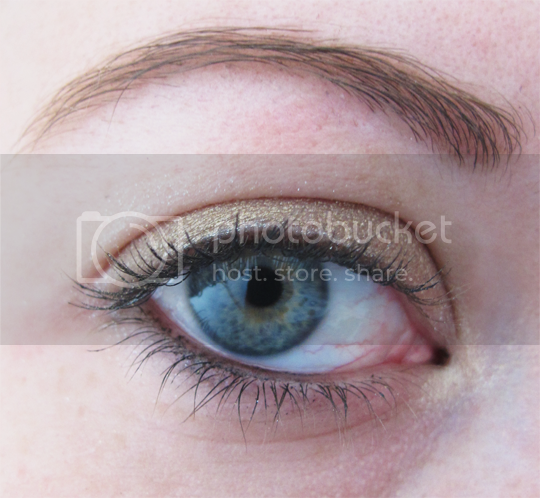 Here’s some quick and dirty eye swatches so you can see what they look like on – unblended n’ all! 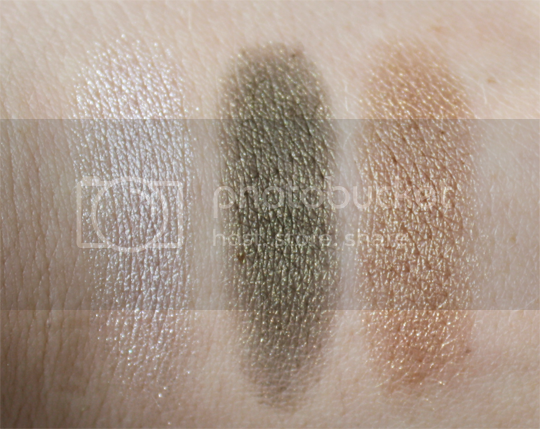 Overall these are fab little shadows and a welcome addition to the drugstore market – the pharmacy brands are really upping their game this year, I’m very impressed! Bourjois 24 Hour Cream Shadows are launching into Boots and Superdrug stores this month – some may already have them – where they will cost a very reasonable £6.99 each. If you only pick up one shade, make it Khaki Cheri. Not just because its my personal favourite, but also because there’s no particularly comparable dupes for this from any competitors – nice one, Bourjois! I’m obsessed with Khaki, so of course I LOVE that shade! Just gorgeous! !